Diesel Fuel for Life Unlimited for Women gives you strength & endurance. 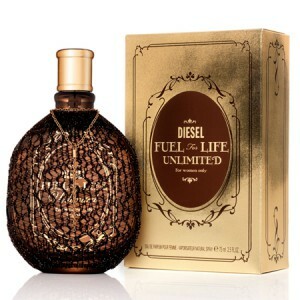 Diesel Fuel for Life Unlimited for Women 75ml. Eau De Parfum - is a floral fruity fragrance for women. Her enchanting aroma is suitable for everyday wear as well as for evening meetings. It is especially ideal for young women who are courageous and have a passionate attitude towards life. Uplifting scent of Diesel Fuel for Life Femme Unlimited gives you strength, endurance and enthusiasm for life. Balanced fragrance Fuel for Life Femme Unlimited do not report your arrival before entering. Not too heavy nor too light is just right. Mingle in her exquisite combination of delicious ingredients from which emerges a modern and charming feminine scent, evoking the feeling female fortune. Enhance your everyday interesting mix of fruits and flowers with a spicy touch. Fragrance was launched in 2008. Fuel for Life Unlimited by Diesel explodes all boundaries to improve its attractiveness and sexuality. This is a new way of calling the freedom of choice and unlimited power over men. Experience the exciting new sensations with a cocktail of juicy fruit and delicate flowers, awakening in you a passionate sensuality and tenderness.